Nefastu was (actually it must be: ‘is’) a band from Oporto, Portugal, that was modestly active at the beginning of this decade. But with exception of some demonstrational material (there were, I think, only two demo-tapes in 2011 and 2012), the band did not exactly record anything that would put their name on the (worldwide) map. Now, after more than six years of silence, the trio returns with three new tracks, gathered on vinyl, being limited to an edition of 150 copies. Portuguese label Purodium Rekords (mind the ‘k’ in ‘reKords’!) have the honours to release this 7” EP. 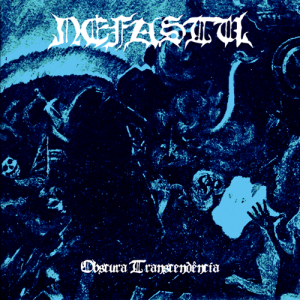 Obscura Transcendência is an extremely filthy, scornful, obnoxious collection of grim, deadly Black Metal. The three songs are fast-as-f*ck, harsh in execution, yet maintaining a certain aspect of melodic grandeur in some way. No, this is not a melodious three-tracker to dance , yet with ‘melodic’ I want to refer to the well-thought structure of all three compositions, rather than talking about a ‘guitar-oriented’ thing. No tremolo leads or long-term solos; it’s the basic fundament, based on the electric and bass guitars. When talking about the latter, the basses, well, these ones are quite advanced and pushing within the final mix, and so are the diverse drum patterns and percussion attacks. Sometimes roaring, then again rhythmic or simply blasting, the drum work add an extra value to the whole. And then I have not mentioned the throat yet: mainly gurgling and raspy - malignant, wretched screaming and caustic acid-puking cords from way beyond Purgatory. This 7” EP brings forth a mostly vicious, vengeful, barbarous and ugly form of thrashing and smashing Black Metal with a timeless and universal approach. The atmosphere is of a mostly pernicious kind, with a touch of evil occultism in it – cf. the additional female voices in Bélica Neblina, for example. Simplistic in some way - in a minimal, taking-no-prisoners way, uncompromising and capricious, averse to fake tolerance and false trendiness. It sounds distorted, with that rough, unpolished production, and hey, doesn’t that sound quality just fit to this sonic expression of evilness? Indeed it does! Old Gorgoroth, Carpathian Forest, Sargeist, Maniac Butcher, Enthroned, Tarnkappe, even early Bathory and Darkthrone, yeah, you know what I mean… Total darkness and death, as the bio says, or a blast of disgust and disease. Don’t we adore it all?